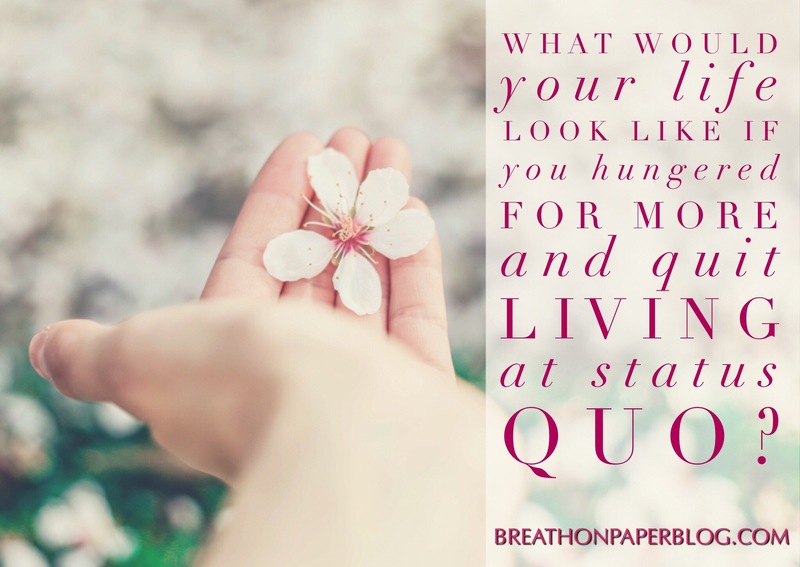 What would your life look like if you hungered for more and quit living at status quo? How would your life change if you allowed your desires to align with God’s desires? A few years after my husband and I were married, we decided to buy a house. As we contemplated our “must-haves” list, I assured him it really didn’t matter to me what we ended up with as long as we had a white picket fence with an adorable cocker spaniel running around in the yard. You’ve heard it said, “If you set the bar low, you’ll always reach it”? The bar couldn’t have been any lower with this house. It was a fixer-upper from the roof to the dirt it sat on. Planted in the middle of what was a neighborhood listed on the National Register of Historic Places, the 102-year-old house was solid and well-built, but the interior was a throwback to the 1950s. We rolled up our sleeves and tackled a long list of must-do’s to bring it back to life. The realtor who had brokered the sale of the house stopped by to see the improvements. “I’m glad owners like you, who can see what a house can become, bought this house” she told us. Really, we didn’t have a plan for how it would look when we were finished; we just decided we didn’t want to settle for managing mediocre. I’ve decided the same for my spiritual life. No more mediocre. Maybe it’s because I’ve gotten to a certain point in life and realized that the materiality of this existence is not what really matters; what matters is what you leave behind. Far more blessings have been extended from God’s hand than I deserve. But I want more than blessings. I don’t know what it looks like or how it will come, but I want God’s favor! Do you think there’s a difference between receiving God’s blessings and receiving His favor? I do. I may not be a Bible scholar, but to me there is a vast difference between the two. Whether a person is a Christian or not, they are blessed. From the breath in our lungs to the comforts of home to the jobs we have, we are blessed. Sadly, so many are satisfied with blessings alone. Kind of like the placebo effect. Your mind tricks you into believing you received what you need, but you don’t feel any better than your unbelieving neighbor. But getting the “real” thing and knowing it’s real because your life is completely changed and extraordinarily satisfying? Divine manna from heaven! Joseph, David, Job — even Jesus’ mother, Mary … each were highly revered and recipients of God’s favor. You’re thinking, But they all endured struggle, hardship, delayed answers, scorn. How is that favor? Imagine what it would feel like to be Joseph, withstanding all that he did — betrayal, separation from family, prison — years of it! — and becoming the No. 2 man in Egypt. Or Job, the man who had it all — but lost it all — and regained it again. David? Hunted like a dog but eventually made king. That’s some pretty hard stuff to endure! But notice — it was because they each sought God’s heart, endured, and remained faithful through their circumstances that they were favored. And the favor didn’t come so they could show the world what they had done. No! The favor came so the world could see what God had done through them! So let me ask, if you were a medical researcher who labored and searched relentlessly for a cure for cancer, would all of the trials and errors have been worth it? Of course! If you knew you could be the vessel God used to bring hope to a hurting world, encouragement to the ill or grief-stricken, would you allow Him to use you? Would you dare? I do! I want the favor of God that opens up doors of opportunity, mind-blowing opportunity. Opportunity that, when realized, speaks to the vastness of God’s ability to move in my life and the lives of others! I want my story to showcase an omnipotent God at work through me, aligning circumstances and outcomes in a way that others’ lives are changed and He receives all of the honor and glory! My earnest desire is to experience God at higher heights and deeper depths than I have ever experienced in my life! Don’t you want that, too? That “same old thing” routine that feels like a weight on your chest … the gnawing “there’s got to be more to life than this” attitude … that’s God at work in you. He wants you to want what He wants for you! Ask Him what that’s all about. Allow Him to lead you from blessing to favor.